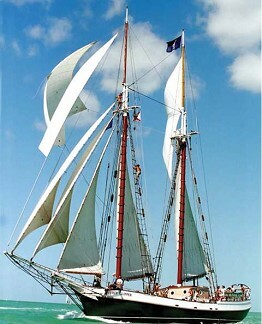 Liberty Clipper is a traditionally-rigged gaff topsail schooner. She is steel-hulled, with broad open decks, state-of-the-art galley, and a spacious and welcoming grand salon. She carries over 4,000 square feet of sail area in three head-sails, gaff-rigged fore- and main-sails, and a gaff topsail. Built in Rhode Island, she is well-equipped with essential safety and navigation equipment, a large diesel engine for auxiliary power, and diesel generators for electrical power. With a water-maker and tankage for almost 1,000 gallons of fresh water you can take hot-showers each day! Liberty Clipper has comfortable accommodations for 28 in two-berth cabins with opening skylights. Each cabin is appointed with yellow pine paneling providing a warm and comfortable feel. Your cabin will be outfitted with fresh linens, towels and even soaps. Each cabin includes a vanity sink with hot and cold running water, and each bunk has a reading light. The ship has 110-volt outlets to charge your camera and other electrical devices. There are a few Premium Cabins with double beds, and some Ensuite Cabins which have double beds and their own bathrooms. In the morning you will wake to the fragrance of freshly baked breads, inviting you to breakfast. You'll have the opportunity to help the crew sail the ship by raising sails or even taking a turn at the helm under the careful supervision of our experienced US Coast Guard licensed captain. You will get underway for a new beach or port each day, and when anchored, you will have access to two-person kayaks, the ship’s sailing dinghy, and snorkeling gear. 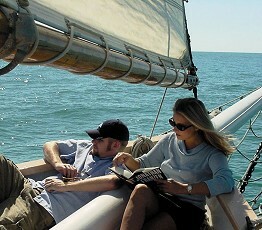 There is ample seating on deck, and you'll always find a quiet place to relax and enjoy the sailing. There is a bar service for beer, wine and cocktails. Each night you will be at anchor, for dinner in the grand salon, and for a restful night’s sleep.